Welcome to the UFO Comic Strips Website. 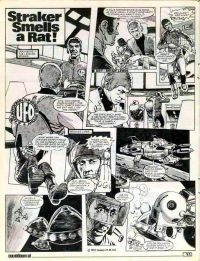 These comic strips have kindly been uploaded to the SHADO Facebook Group by kind volunteers (Martin Goldsack being the main one). I’d also like to thank Ian from the SHADO Forum for the updated and new versions, and Leo Cudder (Admin SHADO Facebook group) for her time and effort scanning some of the more complex colour editions. 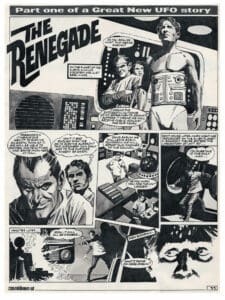 The comics originally appeared in Countdown/TV Action comic published in the early 1970’s. I’ve created the website to make them easier to navigate and view, as well as provide more information about them. It’s aim is to get feedback about the strips for review, so please leave comments on the strips, nostalgia always welcome! When you see the comic strips, you can drag across (right to left) to read, or click on the dots below them, or click the left/right arrows at the edges of the page. The comics resize to whatever you’re viewing them on. Thanks to John Peter Britton for allowing me to use his artwork for the site headers.